Its been a busy day but I am finally getting around to my frugal tip for today. 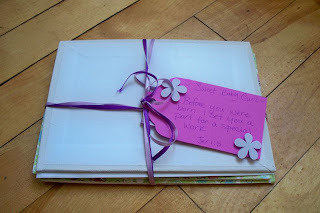 This is a great baby shower gift that turned out wonderful! 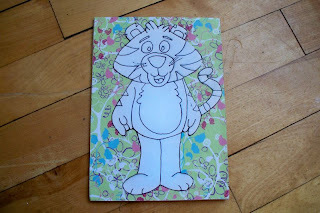 1.Print off some great coloring pages from the internet; it easiest if you print them off onto card stock. 2. Pick out a nice back ground paper. 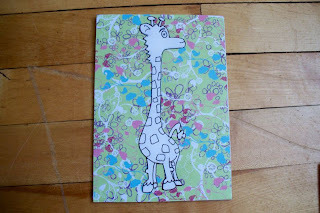 The colors in this paper matched the colors of the nursery. 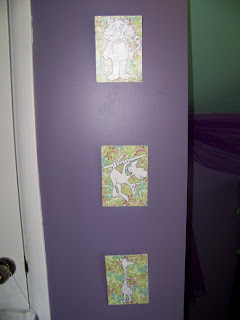 I measured just right and one 12 x 12 page was enough to cover all three mini canvas. 3. 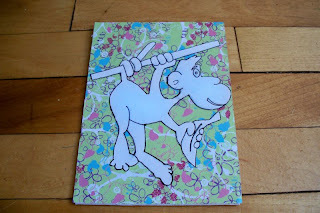 Cut the paper and modge podge it onto the canvas. 5. Using a hot glue gun you can add ribbon on the back to make hanging easy! I have been making cards for a while but had never really gotten into scrap booking. That was until I received a scrap book for Christmas. Since I belong to a "craft group" at our church I new I could count on the wisdom from the other ladies to help me in a new endeavor. With my mom celebrating a special birthday this summer I wanted to do something really nice. 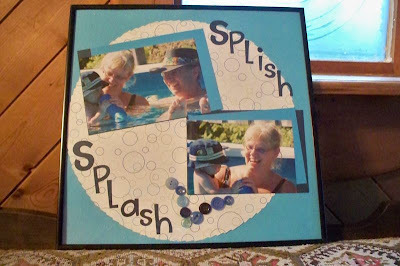 I thought of a scrap book or a photo book but after going through hundreds of pictures (most of her and Eben the only grand child) I decided( instead of putting lots of work into a book that will probably need to be up graded when we have more children) to go with a simpler idea. So I purchased a scrap booking frame and decided that on special occasions or whenever I had really great photos I would scrap book them for my mom so she can frame them. Then the older ones can go into a book of her own!! 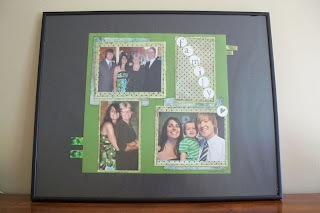 I really liked the frame so when at a church yard sale this summer I picked up this larger black frame for 25 cents and put in a page that I created of our family all dressed up for a wedding. It always get lots of attention when people come to visit!! I can not believe its the last week of August already. Wow the summer flew by! This weeks menu is a very simple since we have lots going on this week. I have already started to plan for the fall. Today I have spent all morning cleaning out the freezers, fridge, and pantry. I am getting ready to load up for the winter. So here is whats cookin this week. Of course its all subject to change due to the hot and humid weather we have been having. Frugal Friday is back!!! I have so many frugal tips to share so I am excited to get back to blogging! This is one of my favorite summer tips! 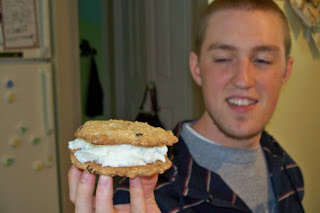 Making your own ice cream sandwiches. You start by making up a batch of your favorite cookies. I usually make an oatmeal, coconut, chocolate chip cookie. 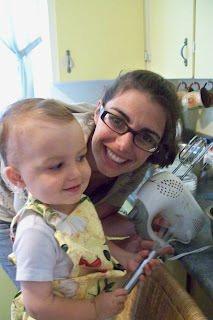 My kitchen helper is getting much better in the kitchen now! 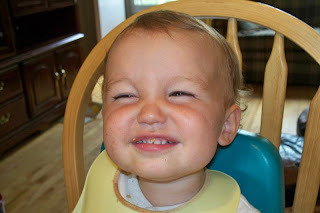 When the cookies are finished baking and have cooled down. I put one scoop of ice cream on one cookie and top it with another. You lay these on a cookie sheet and put in the freezer for ~1 hour. When finished wrap each cookie in plastic wrap! Our cookies usually don't last too long but I would say they probably store about 1-2 weeks. 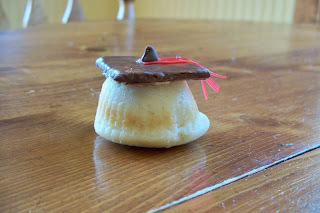 These treats get two thumbs up from our family! 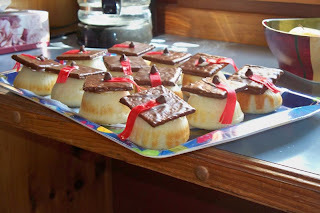 So for there party I decided to make some yummy graduation cup cakes. The recipe was found here and the idea came from Kraft. We are back from our two week missions trip! It was great to spend those two weeks ministering together with friends and family. To see what we were up to you can check out the blog. While we were away the cooks did a great job preparing meals from lots of donated food that came in. They did a great job presenting the food so it look very appetizing. 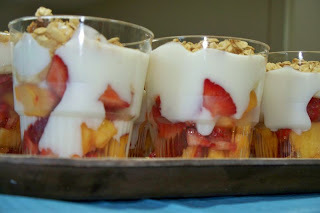 These fruit salad cups were prepared with all donated fruit...thank you Lord for providing! 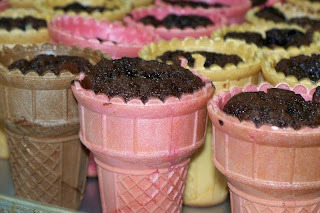 At the end of the two weeks together we shared a special feast and the cooks whipped up these cupcake ice cream cones. 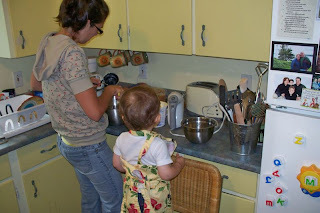 They were simple to make all she did was make brownies from a mix. spooned it into the ice cream cones and baked. 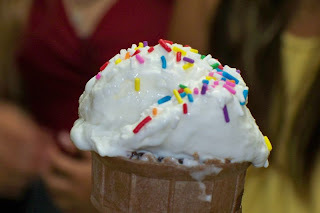 When they were finished you let cook and top with ice cream and sprinkles. 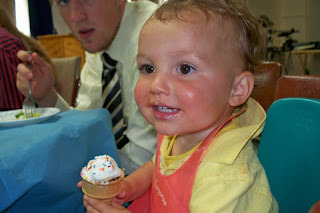 Eben really enjoyed this treat!! Since we have only been back for 2 days now I got lots of things to get done around here. But man oh man is it hot!!! Which is great but not for cooking or working. I think I will spend the afternoon (with the little guy) in his pool! Tonight I have planned to make a delicious hodge podge with all the fresh veggies from our garden!